It was a quick drive through Salt Lake City on I-80 to our destination of Saltair on the Great Salt Lake. Saltair, a colossal recreation hall was built in 1893 to provide access to swimming in the Lake. By the early 1920's it drew 500,000 visitors per year until it burned down in 1925. Saltair II was quickly built but failed due to fire and floods and economic downturns. Saltair III was built in the early 80's but suffered a flood and didn't reopen until 1993. It is now a concert venue. We arrived the morning after a big concert and what a mess. One of the workmen gave us a guided tour of the hall. He said it was built in Europe and shipped over here for assembly on the site. My first visit here was in 1950 with my family and we swam in the water which allows you to float without a floaty and read a newspaper (see postcard photo). Sailing on the Great Salt Lake is a popular sport and a state park provides slips and a boat ramp. The water is currently very low. I-80 runs beside the Lake for many miles. There are two large companies, Morton and Cargill that mine salt in evaporation ponds and then put it in huge piles. A railway line is used to ship it out. Nearing the salt flat one form of entertainment is to drive your car into the flat. However, these folks got their car stuck in the slushy sand from a recent rain storm. Another pastime is to use rocks to spell out the name of your friends beside the road. One attraction looks like an old microwave tower but when you get close it's a sculpture. Finally just before heading inland there is a rest stop where you can park and walk on the flat. We turned left at Wendover and took US 93A due south for 120 miles south to Ely. The main industry here appears to be gambling. We are staying at the RV Park beside the Prospector Hotel and Gambling Hall. I am glad we are in the View as the hotel and gambling hall are pretty tired. Tomorrow we will try to get within 100 miles of Yosemite, CA. Then we can spend two days in the area before heading for Carmel. 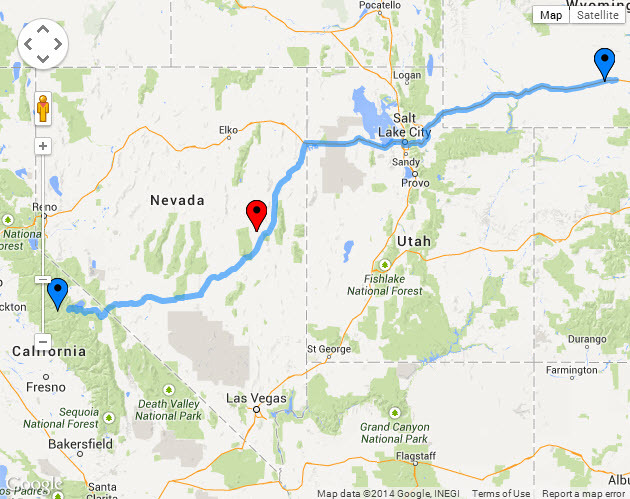 The map shows our route fromRawlins last Friday to Yosemite on Tuesday. The red dot is Ely.